Bhubaneswar : As the city decorates itself with a new colour to welcome Goddess Durga, the Bhubaneswar Municipal Corporation (BMC) has taken up several measures including the development of four immersion ponds (under construction), so that the festival will be safe and with minimal pollution. The sanitation agencies and sanitation workers of BMC have been asked to carry out extra cleaning work near Puja pandals to make them clean. 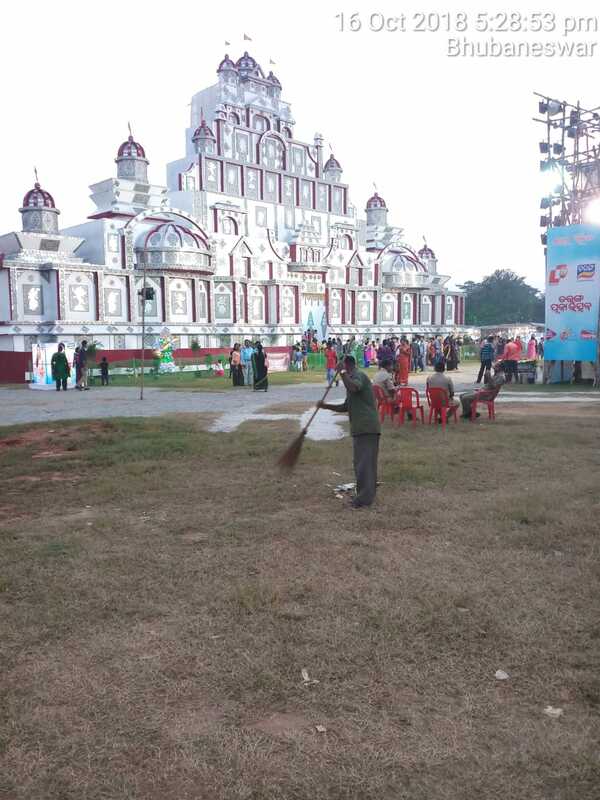 Puja organisers were advised to use extra dustbins. The civic body has asked the Puja organisers to have restricted use of synthetic substance, colour and more use of organic things by so that there would be minimal pollution during immersion. Organisers were also asked to limit sound near Puja pandals to around 60 decibels to minimise noise pollution. “In order to make the people more aware during the festival season hoardings are being designed with themes like public littering, restricted use of plastic/polythene, Swachha Bharat Abhijan near Puja pandals.’’ said City Health Officer Dr. Ramachadra Rout. Awareness programme by public announcement and tableau (“ratha’’) on public littering, no use of plastic/polythene, Swachha Bharat Abhijan, which would continue for another one week from tomorrow so that with the public address system volunteers can make people aware across the city. BMC has already started a trial run of a radio jingle and it will be on air from tomorrow at least for a week to continue the awareness drive. Sources said Puja organisers were also asked by BMC to use special chemicals to minimise fire incidents, in case of any mishap. The Engineering Wing of BMC has ensured levelling all potholes near Puja pandals across the city. Nearby drains of Puja pandals were covered with concrete slabs. Streetlights near all Puja pandals were either repaired/problems addressed. While the two immersion ponds near Pandara are with sizes 8,000 square feet and 3,000 square feet respectively under Engineering Division I of BMC, along Daya river one near Tankapani bridge is of 4,582 square feet and the other near Daya river along Puri NH is of 2,784 square feet respectively under Engineering Division II of BMC . The four immersion ponds will be ready before Dusshera. Proper signage will be developed to guide the Puja Samitis to identify the immersion ponds.